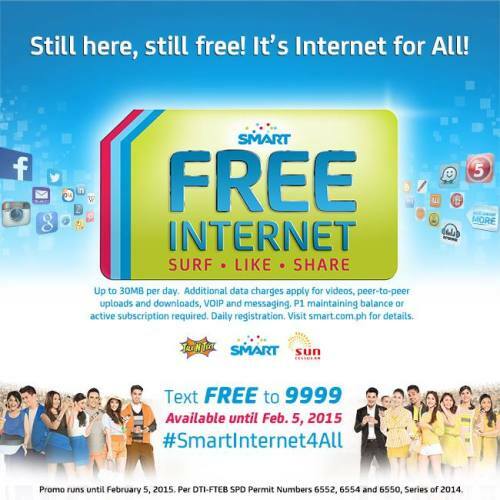 To celebrate the New Year, Smart Communications is giving you the chance to enjoy FREE INTERNET. The Smart #FREEInternet Promo is extended until February 15. That’s free internet until 2/15/2015. Subscribers get up to 30 MB free mobile internet per day. Additional data charges apply for videos, peer-to-peer uploads and downloads, VOIP and messaging. A maintaining balance of P1 or an active subscription is required. Daily registration is also needed. Just text FREE to 9999 to avail of this awesome promo. Share the great news, #SmartInternet4All. #LiveMore with Smart. For more information about this promo and other amazing offers from Smart Communications, visit the Smart site at http://www.smart.com.ph or follow their page at https://www.facebook.com/SmartCommunications. You may also get updates via @smartcares on Instagram and @smartcares on Twitter.